Even before moving to France, I began making ratatouille. For a while just out of college I worked with a young French woman from Provence. She had long blonde hair and wore tie-dyed skirts that nearly reached the ground. She’d only been in Santa Fe for a few months when we met and, like me, was trying to figure out what to do with her life. It was this, and our mutual passion for food, that helped us get along so well. One day, Marie (I’ll call her) opted to have ratatouille for lunch. I was skeptical about the version the restaurant we worked in sold, but she seemed to think it was adequate enough for a quick meal. The only way I had seen it served (or served it myself) was inside a crepe. Unlike the more standard options (cheese and ham or even creamed spinach), this crepe quickly became sloppy and the juices would flood over the plate. Hardly anyone ever ordered the ratatouille crepe. Thus, I was intrigued that a real French woman would dare eat the pastry shop’s ratatouille and watched as she explained to the cook that no she didn’t want the crepe with it. She wanted a fried egg. That evening when I got home, I made myself some ratatouille. I figured there was no need for a recipe and enthusiastically chopped up the vegetables I deemed worthy. Marie had told me it was easy and she made it all the time, always with an egg on the side. The sweet smell of tomatoes and red peppers filled the house as I let the vegetables simmer. The next day, I told Marie that I had made ratatouille and that it was one of the best things I had ever eaten. Maybe I’m massacring tradition with my one-pot ratatouille, but, knowing Marie, she wouldn’t have bothered with too many pots, and definitely not with too much precision. I’m purposely leaving out how much of each ingredient to use, as it changes each time I make it. I even forgot the tomatoes once and ended up with what kind of resembled baba ganoush – quite nice, actually. I also often make my ratatouille without onion – no real reason. 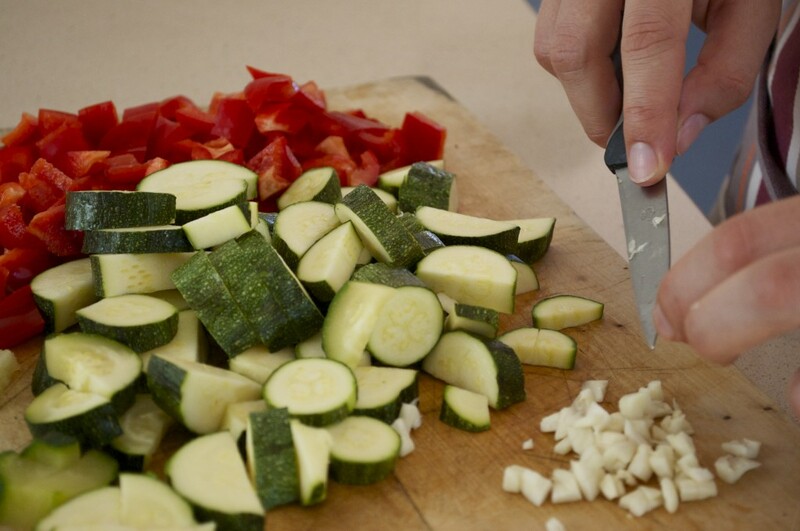 For me, the essentials are garlic, peppers, eggplant and zucchini. 1. Prepare all the vegetables by chopping them into small/medium-sized pieces. 2. In a large pot, sauté the garlic and onion over medium heat. 3. Add the peppers, cover and cook until they begin to soften (stir regularly). 4. Add the eggplant, zucchini, tomatoes and some salt. 5. Reduce heat and simmer (covered) until all the vegetables are thoroughly cooked (about 45 minutes). Longer simmering brings out more flavor. This entry was posted in Recipes (All), Recipes (Gluten-free), Recipes (Vegan) and tagged sides, vegetables. Bookmark the permalink. I agree! I love ratatouille and always make it using just one pot. But the egg on the side– that’s a great idea! Will definitely have to try that next time! 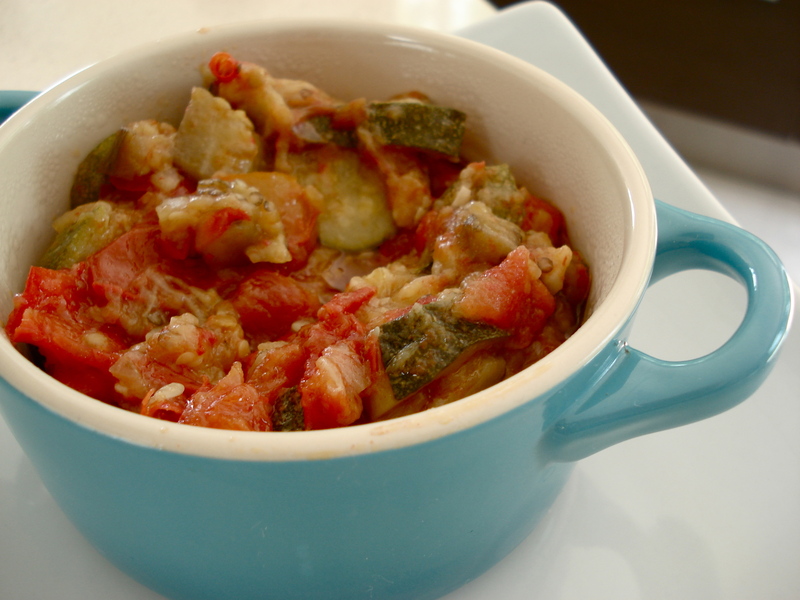 Do you remember how we’d eat ratatouille for days junior year? I would get so tired of it after awhile. The other day I had a craving for it since it’s “ratatouille season.” Can’t wait to try out your recipe. Oh, I do remember that, Carrie. I recall the pot being so big, our hostess would leave it out on the windowsill; there wasn’t room for it in the Parisian fridge!